Week 2 of our master bedroom makeover was all about painting. 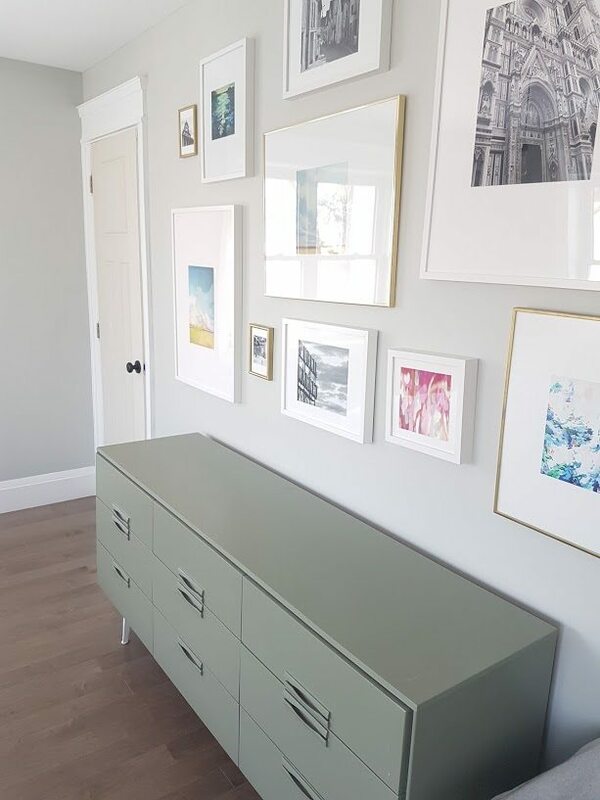 Luckily we had painted the wall colour a muted green-gray a couple of years ago in the bedroom and still dig it (“Blenheim Palace” by Para Paints), so that didn’t have to change. What we did have to paint though, were a thrifted dresser and the interior doors. First up was that dresser. 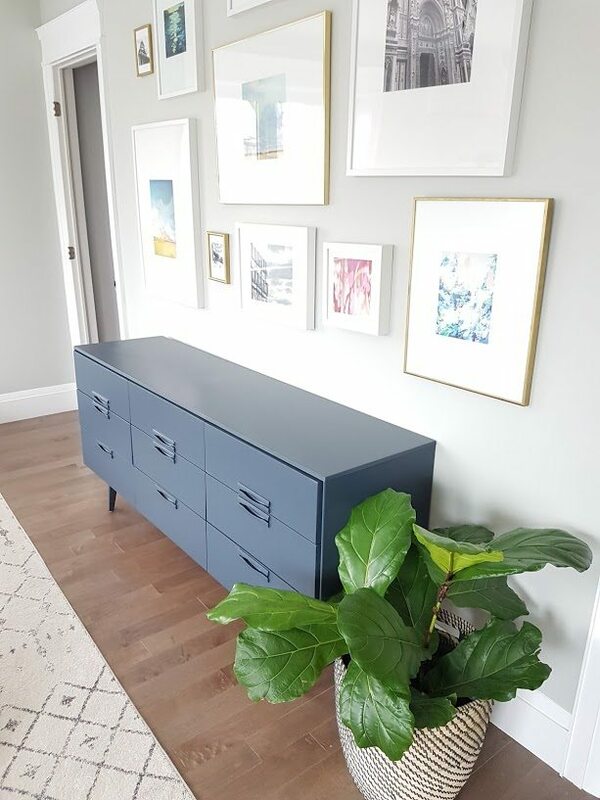 It was a piece I scored off Kijiji a few years ago when we had just finished our renovation. We needed something long for that wall, and I wanted something with mid-century lines. I came across this one for around $40 that was just right. Now that I finally got around to fixing my initial mistake, it was time to go dark. I contemplated doing white, but just kind of figured that although it was a safe choice, a dark colour would really add so much more drama. Navy blue for the win! 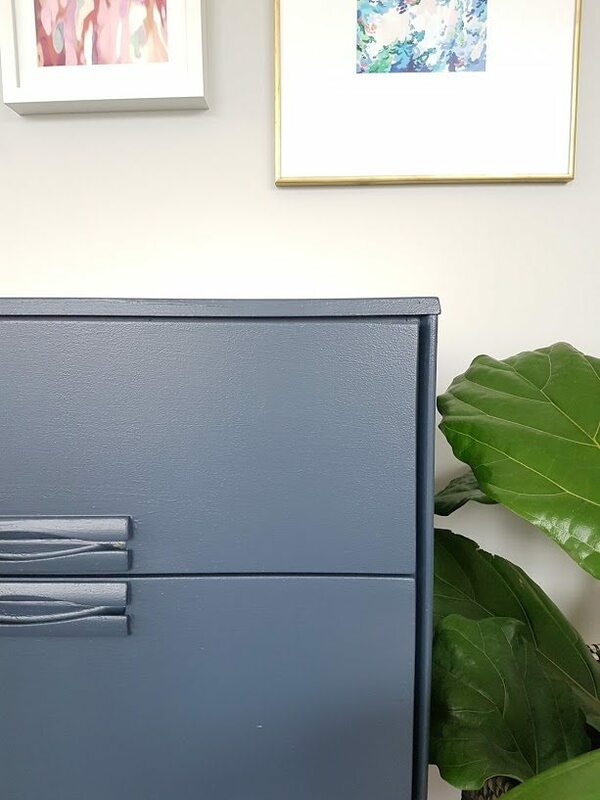 This colour is “State of the Art” by Para Paints (their furniture and cabinet line of paint). It went on like a dream, and two coats gave amazing coverage. Doesn’t it look much better against the wall colour now? #1: Prep is super important. Sand the piece well, fill any holes in the wood with wood filler, sand again, and then wipe it down so that it is super clean. You want it to be as smooth as possible – any gnarly bits show up way more once they are painted. The better prepped your piece is, the better it’ll turn out. #2: Use the right paint. 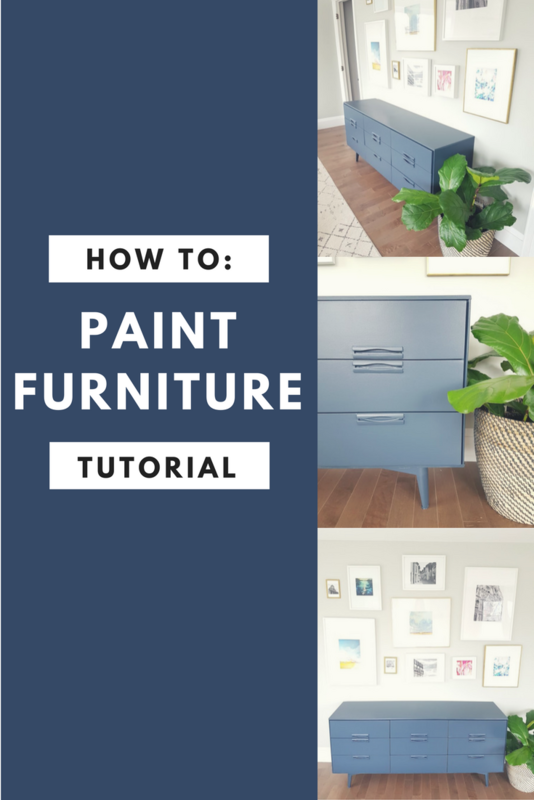 Use a furniture grade line of paint so that you know it will cover well and stand up to wear and tear. Pretty much every brand of paint has a furniture-specific line. You can also use a melamine paint, but it can be harder to clean (it’s not water based). 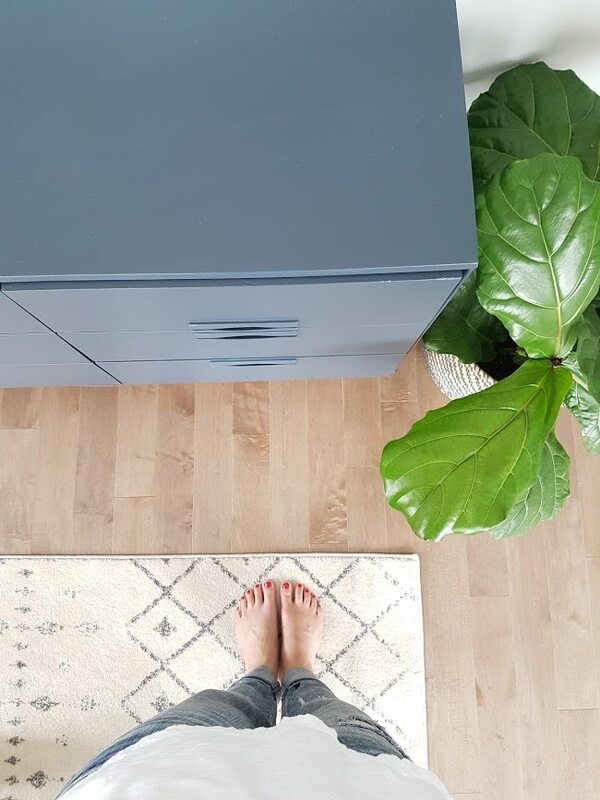 The other option is to go with a chalk paint, but only if you want that matte chalky finish. If you want to go one step further with ensuring it’s not going to chip or wear, you can add a polyurethane top coat to seal it really well, which is good for high traffic areas. This is my FAVOURITE brand of top coat. #3: Use the right tools. Using a high quality paintbrush and roller really DOES make a difference to how well the paint goes on. After years and years of painting (walls, furniture, you name it! ), I have a few favourites: Purdy paintbrushes, shur-line foam rollers, and when painting walls or ceilings a Handy pail is a life-saver. There are some links to these products below. My other tip? Involve your toddler! 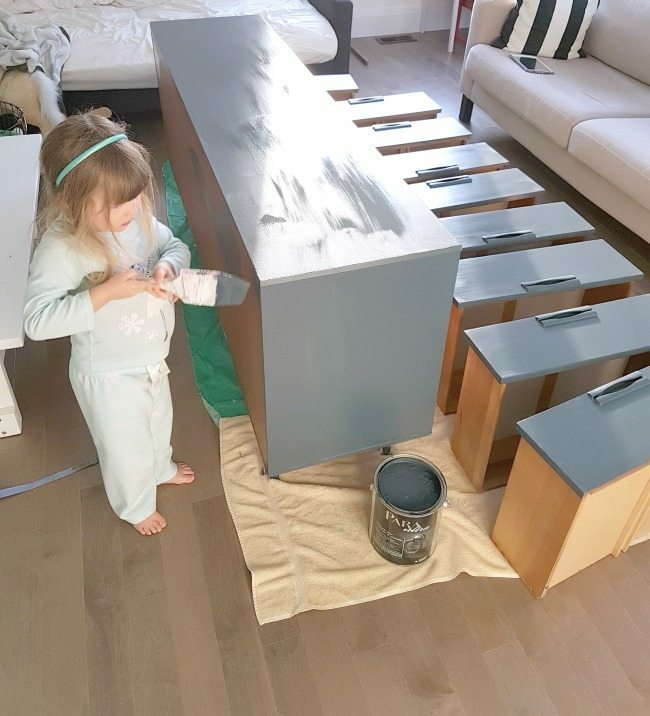 Maya is always asking to be my helper, so I let her come in for a bit and let her paint a drawer and the back of the dresser – in her PJs! 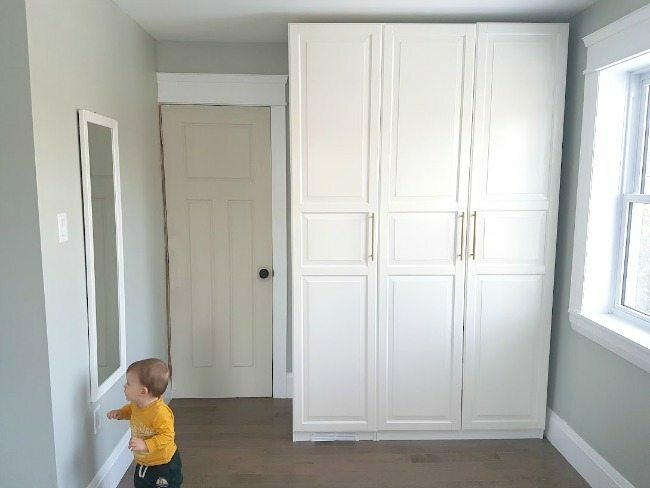 I didn’t want her to be smelling the fumes for too long (even though this is a low VOC paint – I still worry about that stuff), but 10 minutes of helping mummy gave her a ton of satisfaction. My budding little DIYer. Next up were the doors. The two interior doors in the room (one to our bathroom, the other to my closet) had never been painted at all. See how awful they looked – yellow/cream colour next to our bright white trim? And pardon the toddler photo-bomb. That kid is a wild one! 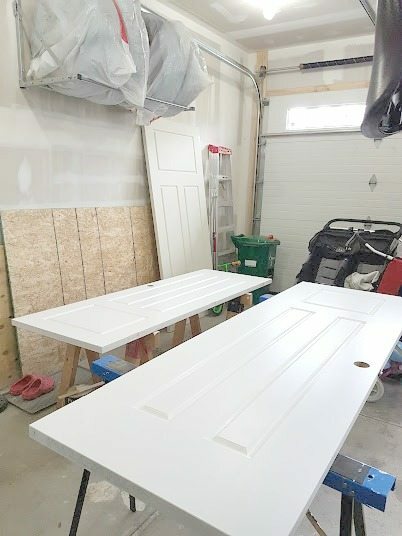 I have the doors a couple coats of the white I have used throughout the house – “Jo Jo Whitewash” by Para Paints. #1: Always take them off when painting. You won’t get any drips if they are laid out horizontally on sawhorses, and it’s just so much easier and faster. You also want to remove the doorknobs so make sure you get perfect coverage, and no paint on your hardware. And #2: Use a foam roller instead of a paintbrush. The paintbrush will leave brush marks, whereas using a high quality small foam roller will give the doors that factory finish look you want. Like I mentioned earlier, I like the shur-line brand of mini rollers. You will need to use a paintbrush to get into any moulding, but then can use the foam roller across the rest of the door. 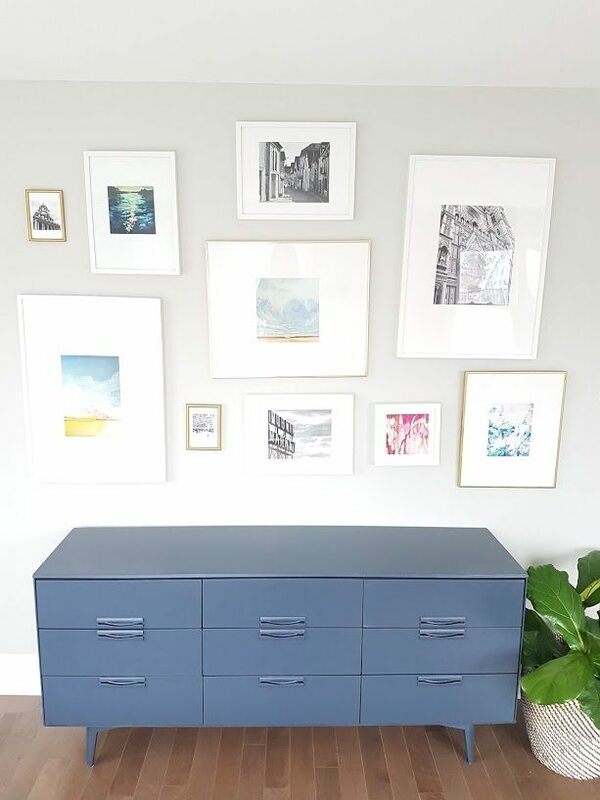 Next up for this room makeover we are tackling the Pax wardrobe (building it in, so it looks custom) and creating some biiiig artwork to replace the gallery wall. 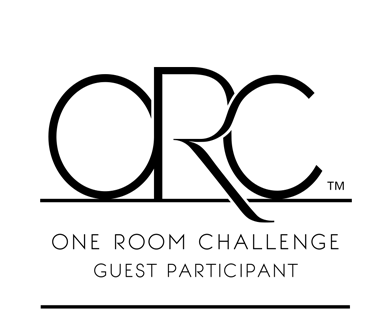 Don’t forget to check out all the other makeovers that are happening as part of the One Room Challenge! And come on back here next week to see what we do next in this master bedroom makeover. It looks so good in the navy! Great choice of colour, Jemma. Love, love , love that blue you used on the dresser! It looks fantastic! Thanks so much Lauren!! xo.